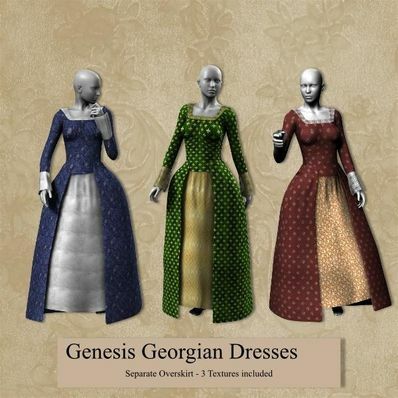 A Georgian Dress for Genesis for use in Daz Studio 4. Three textures included. Searate Overskirt - set to collide with the dress.Will work with most poses and shapes. Copy the data, people and Runtime folders to your "/Documents/DAZ 3D/Studio/My Library" folder. Oh boy, Now this is something I really needed for my old fashioned ladies. So many thanks, you are such a great artist.